본 발명은 무선 통신 시스템에서 소정의 CP(Cyclic prefix) 길이를 가지는 프레임을 이용하여 신호를 전송하는 방법에 관한 것이다. The invention relates to a method of transmitting a signal by using a predetermined frame having a CP (Cyclic prefix) length in a radio communication system. 상기 방법은 기지국으로부터 제1 프레임을 이용하여 신호를 수신하는 단계, 및 상기 제1 프레임을 이용하여 상기 기지국으로 신호를 전송하는 단계를 포함한다. The method includes transmitting a signal to the base station by using a method comprising: receiving a signal using a first frame from a base station, and the first frame. 상기 제1 프레임은 상기 복수의 셀 중에서 제1 셀에서 지원하는 프레임이고, 상기 제1 프레임은 상기 복수의 셀 중에서 제2 셀에서 지원하는 제2 프레임과는 다른 프레임이며, 상기 제1 프레임은 상기 제1 프레임의 상향링크 영역과 상기 제2 프레임의 하향링크 영역이 중첩(overlap)되는 영역 또는 상기 제1 프레임의 하향링크 영역과 상기 제2 프레임의 상향링크 영역이 중첩되는 영역이 천공(puncturing)되는 구조로 되어 있고, 상기 제1 프레임의 CP의 길이와 상기 제2 프레임의 CP 길이는 서로 상이하다. The first frame is a frame that is supported by a first cell of the plurality of cells wherein the first frame is the different frame and the second frame supported by the second cell from the cell of the plurality, the first frame is the claim 1 uplink region and the downlink region and the region where the UL region is overlapping of the second frame of the second frame DL region is superimposed (overlap) area or the first frame is of a frame perforation (puncturing) and a structure that is, the length of the CP length of CP of the first frame and the second frame are different from each other. 본 발명은 무선 통신 시스템에 있어서, 소정의 CP(Cyclic prefix) 길이를 가지는 프레임을 이용하여 신호를 전송하는 방법에 관한 것이다. The present invention relates to a wireless communication system, to a method of transmitting a signal by using a predetermined frame having a CP (Cyclic prefix) length. IEEE 802.16m 시스템은 H-FDD(Half- Frequency Division Duplex) 단말 동작을 포함하는 주파수 분할 듀플렉스(FDD: Frequency Division Duplex) 방식 및 시간 분할 듀플렉스(TDD: Time Division Duplex) 방식을 모두 지원할 수 있다. IEEE 802.16m system, H-FDD (Half- Frequency Division Duplex) frequency division duplex containing the terminal operation is capable of supporting all of the:: (Time Division Duplex TDD) scheme (FDD Frequency Division Duplex) scheme and a time division duplex. IEEE 802.16m 시스템은 하향링크(하향링크: DownLink) 및 상향링크(상향링크: UpLink)에서 다중 접속 방식으로 직교 주파수 분할 다중 접속(OFDMA: Orthogonal Frequency Division Multiplexing Access)을 이용한다. IEEE 802.16m system, the downlink uses: (Orthogonal Frequency Division Multiplexing Access OFDMA) (DL:: DownLink) and an uplink (UL UpLink) OFDMA as a multiple access scheme in. 이러한 OFDMA 파라미터에 대한 내용을 살펴보면 다음 표 1과 같다. Looking for more information on these OFDMA parameters given in Table 1. 이하에서 IEEE 802.16m 시스템의 프레임에 대해 간략히 살펴본다. Look below for a brief frame of the IEEE 802.16m system. 도 1은 IEEE 802.16m 시스템에서의 기본 프레임을 나타낸 도면이다. 1 is a diagram showing the basic frame in the IEEE 802.16m system. 도 1을 참조하면, 각각의 20ms 수퍼프레임은 4개의 같은 크기의 5ms 무선 프레임으로 나누어지며, 수퍼프레임은 수퍼프레임 헤더(SFH: super프레임 header)로 시작된다. 1, each of the 20ms superframe is divided into four 5ms radio frames of the same size, the super frame is a super frame header starts with (SFH super frame header). 5MHz, 10MHz 및 20MHz 중 어느 하나의 채널 대역폭을 가지고 표 1에 나타낸 것과 같이 동일한 OFDMA 파라미터들을 이용하는 경우, 각 5ms의 무선 프레임은 8개의 서브프레임으로 구성된다. 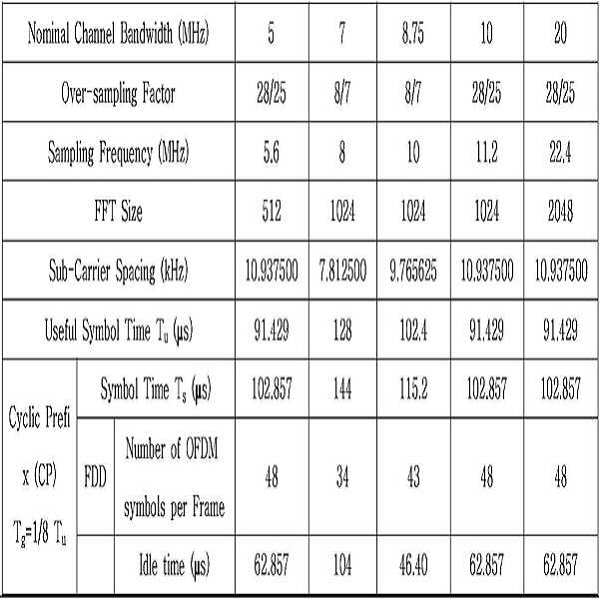 Have any of the channel bandwidth of 5MHz, 10MHz, and 20MHz when using the same OFDMA parameters as shown in Table 1, radio frame of 5ms, each is composed of eight subframes. 하나의 서브프레임은 하향링크 또는 상향링크 전송을 위해 할당될 수 있다. One subframe can be allocated for a downlink or uplink transmission. 제1 타입 서브프레임은 6개의 OFDMA 심볼로 구성된 서브프레임이고, 제2 타입 서브프레임은 7개의 OFDMA 심볼로 구성된 서브프레임, 제3 타입 서브프레임은 6개의 OFDMA 심볼로 구성된 서브프레임으로 정의할 수 있다. The first type sub-frame is a sub-frame consisting of 6 OFDMA symbols, the second type sub-frame is a sub frame, the third type sub-frame consists of 7 OFDMA symbols is defined as a subframe comprised of 6 OFDMA symbols . 기본 프레임은 H-FDD 단말 동작을 포함하여 FDD 방식 및 TDD 방식에 모두 적용될 수 있다. The basic frame is to be applied to both the FDD scheme and the TDD scheme includes the H-FDD UE operation. TDD 시스템에서 각 무선 프레임에서의 전환점(switching points) 수는 2개이다. The switch points in each of radio frames in the TDD system (switching points) number is two. 전환점(switching points)은 하향링크로부터 상향링크로 또는 상향링크로부터 하향링크로의 방향성의 변화에 따라 정의될 수 있다. Switch points (switching points) can be defined in accordance with the change of the orientation of the downlink from the uplink from the downlink or the uplink. H-FDD 단말은 FDD 시스템에서 포함될 수 있고, H-FDD 단말의 관점에서의 프레임은 TDD 프레임과 유사하다. H-FDD UE of the frame in terms of the H-FDD the terminal may be included, in the FDD system is similar to the TDD frame. 그러나 하향링크 및 상향링크 전송은 2개의 개별 주파수 대역에서 일어난다. However, the DL and UL transmission takes place in two separate frequency bands. 하향링크 및 상향링크 간의 전송 간격(transmission gaps)(또한 그 반대)은 전송 및 수신 회로를 전환하도록 요구된다. Transmission interval between downlink and uplink (transmission gaps) (also vice versa) is required to switch the transmission and reception circuit. 도 2는 하향링크 및 상향링크 비율이 5:3인 TDD 프레임의 일 예를 나타낸 도면이다. Figure 2 is a down-link and up-link ratio 5: 3 is a view showing an example of a TDD frame. 도 2를 참조하면, OFDMA 심볼 주기가(symbol duration) 102.857μs 이고 유효 심볼 길이(Tu)의 1/8에 해당하는 길이를 CP(Cyclic Prefix) 길이로 가진다고 가정하면, 제1 타입 서브프레임 및 제3 타입 서브프레임의 길이는 각각 0.617ms 및 0.514ms이다. Assuming Referring to Figure 2, the OFDMA symbol period (symbol duration) 102.857μs is said to have a length corresponding to 1/8 of the effective symbol length (Tu) as a CP (Cyclic Prefix) length, the first type sub-frame and a the length of the third type sub-frame is 0.617ms and 0.514ms, respectively. 마지막 하향링크 서브프레임 SF4는 제3 타입의 서브프레임이다. Last DL sub-frame SF4 is a sub-frame of the third type. 전송전이간격(TTG: Transmit Transition Gaps) 및 수신전이간격(RTG: Receive Transition Gaps)은 각각 105.714μs 및 60μs 이다. Transmission transition gap (TTG: Transmit Transition Gaps) and receive transition gap (RTG: Receive Transition Gaps) are each 105.714μs and 60μs. 다른 수비학(numerology)에서는 프레임 별 서브프레임의 수 및 서브프레임 내의 심볼의 수는 다를 수 있다. Other numerology (numerology) the number of symbols in a frame-by-frame number of the sub-frame and sub-frame may be different. 도 3은 FDD 방식에서의 프레임의 일 예를 나타낸 도면이다. Figure 3 is a view showing an example of a frame in the FDD scheme. 도 3을 참조하면, FDD 방식을 지원하는 기지국은 동일한 RF(Radio Frequency) 반송파로 동작하는 하프-듀플렉스(half-duplex) 및 풀-듀플렉스(full-duplex) 단말을 동시에 지원할 수 있다. 3, the base station supporting the FDD scheme is half that operate at the same RF (Radio Frequency) carrier-can support duplex (full-duplex) terminal at the same time-duplex (half-duplex) and the pool. FDD 방식을 지원하는 단말은 H-FDD 또는 FDD 방식 중 어느 하나를 이용하여야 한다. UE supporting FDD scheme is to be used for any one of the H-FDD or FDD manner. 하향링크 및 상향링크 모두의 전송을 위해 모든 서브프레임이 이용 가능하다. All the sub-frame for the transmission of both the downlink and uplink is available. 하향링크 및 상향링크 전송은 주파수 영역에서 구분될 수 있다. Downlink and uplink transmission may be divided in the frequency domain. 하나의 수퍼프레임(super frame)은 4개의 프레임으로 나누어지고, 하나의 프레임은 8개의 서브프레임으로 구성된다. Is divided into a single super-frame (super frame) is four frames, one frame consists of 8 subframes. 도 4는 유효 심볼 길이(Tu)의 1/16에 해당하는 CP 길이를 갖는 TDD 및 FDD 프레임을 나타낸 도면이다. Figure 4 is a diagram of a TDD and an FDD frame having a CP length corresponding to 1/16 of the effective symbol length (Tu). 도 4를 참조하면, 5MHz, 10MHz, 20MHz의 채널 대역폭에 대하여, 유효 심볼 길이(Tu)의 1/16에 해당하는 CP 길이를 갖는 IEEE 802.16m 시스템의 프레임은 FDD 방식에서 5개의 제1 타입 서브프레임 및 3개의 제 2 서브프레임을 가지며, TDD 방식에서 6개의 제1 타입 서브프레임 및 2개의 제2 타입 서브프레임을 가진다. Referring to Figure 4, 5MHz, 10MHz, for a channel bandwidth of 20MHz, the effective symbol length (Tu) of the IEEE 802.16m frame system having a CP length corresponding to 1/16 is in the FDD scheme, the five first type of sub- having a frame and three second sub-frame, and has six first-type sub-frame and the two second-type sub-frame in a TDD scheme. OFDMA 심볼 주기(symbol duration)가 97.143μs 이고 유효 심볼 길이(Tu)의 1/16에 해당하는 CP(Cyclic Prefix) 길이를 가진다고 가정하면, 제1 타입 서브프레임 및 제2 타입 서브프레임의 길이는 각각 0.583ms 및 0.680ms이다. 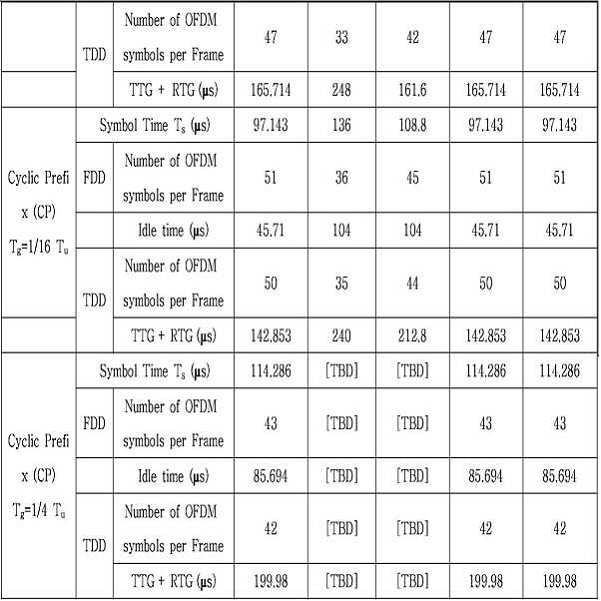 OFDMA symbol period (symbol duration) is 97.143μs is assumed that when a CP (Cyclic Prefix) length corresponding to 1/16 of the effective symbol length (Tu), the first type sub-frame and a second type of sub-frame lengths, respectively It is 0.583ms and 0.680ms. TTG 및 RTG는 각각 82.853μs 및 60μs이다. TTG and RTG are each 82.853μs and 60μs. 다른 수비학(numerology)에서는 프레임 별 서브프레임의 수 및 서브프레임 내의 심볼의 수가 다를 수 있다. Other numerology (numerology) may be different from the number of symbols in a frame-by-frame number of sub-frames and sub-frames. FDD의 경우에는, 프레임의 구조(서브프레임의 개수, 타입 등)는 각 특정 프레임에 대하여 상향링크와 하향링크가 동일해야만 한다. For FDD, the structure of the frame (the number of sub-frames, type, etc.) must have the same uplink and downlink for each specific frame. IEEE 802.16m 시스템에서, 5, 10, 20, 7, 8.75 MHz 대역에 대해서 유효 심볼 길이의 1/4에 해당하는 CP 길이를 가지는 프레임을 정의할 때, 기본 서브프레임인 제1 타입 서브프레임을 많이 이용하기 위해서 다른 CP 길이를 이용하는 프레임보다 하나 작은 서브프레임으로 프레임을 구성할 수 있다. When defining a frame having a CP length corresponding to 1/4 of the effective symbol length with respect to the in the IEEE 802.16m system, 5, 10, 20, 7, 8.75 MHz band, a lot of the primary sub-frame of the first type sub-frame in order to take advantage of more frames using a different CP length may constitute a frame with a small sub-frame. 이때, 유효 심볼 길이의 1/4에 해당하는 CP 길이를 가지는 프레임은 다른 CP 길이의 프레임과 프레임 정렬(alignment)이 맞지 않아 간섭을 일으키게 된다. In this case, the frame having a CP length corresponding to 1/4 of the effective symbol length is not to interfere with the frame and frame alignment (alignment) of the other CP lengths match. 따라서, 서로 다른 CP 길이를 가지는 프레임에 있어서, 간섭을 막고 상향링크 및 하향링크 정렬을 맞추기 위한 방법이 필요하다. Thus, in a frame having a different CP length, prevent the interference, there is a need for a method for adjusting the uplink and downlink aligned. 본 발명의 목적은 소정의 CP(Cyclic Prefix) 길이가 적용되는 프레임 간의 정렬을 맞추어, 프레임 간의 간섭을 방지하는 방법을 제공하는 것이다. An object of the present invention by aligning the alignment between the predetermined CP (Cyclic Prefix) length frame to be applied, to provide a method of preventing interference between the frames. 본 발명에서 이루고자 하는 기술적 과제들은 이상에서 언급한 기술적 과제들로 제한되지 않으며, 언급하지 않은 또 다른 기술적 과제들은 아래의 기재로부터 본 발명이 속하는 기술분야에서 통상의 지식을 가진 자에게 명확하게 이해될 수 있을 것이다. SUMMARY OF THE INVENTION In the present invention are not limited to the technical problem mentioned above, it is not mentioned another technical problem will be clearly understood to those of ordinary skill in the art from the following description It will be. 상기 과제를 해결하기 위한 본 발명의 일 양상에 따른 복수의 셀을 지원하는 무선 통신 시스템에서 소정의 CP(Cyclic prefix) 길이를 가지는 프레임을 이용하여 신호를 전송하는 방법은, 기지국으로부터 제1 프레임을 이용하여 신호를 수신하는 단계, 및 상기 제1 프레임을 이용하여 상기 기지국으로 신호를 전송하는 단계를 포함하며, 상기 제1 프레임은 상기 복수의 셀 중에서 제1 셀에서 지원하는 프레임이고, 상기 제1 프레임은 상기 복수의 셀 중에서 제2 셀에서 지원하는 제2 프레임과는 다른 프레임이며, 상기 제1 프레임은 상기 제1 프레임의 상향링크 영역과 상기 제2 프레임의 하향링크 영역이 중첩(overlap)되는 영역 또는 상기 제1 프레임의 하향링크 영역과 상기 제2 프레임의 상향링크 영역이 중첩되는 영역이 천공(puncturing)되는 구조로 되어 있고, 상기 A method of transmitting a signal in a wireless communication system supporting a plurality of cells in accordance with an aspect of the present invention for solving the above problem using a predetermined frame having a CP (Cyclic prefix) length, the first frame from the base station receiving a signal based on, and the first, and by using the first frame comprises the step of transmitting a signal to the base station, wherein the first frame is a frame supporting in the first cell of the plurality of cells wherein the first frame is the different frame and the second frame supported by the second cell from a plurality of cells wherein the first frame is the uplink region and the downlink region of the second frame of the first frame to be superimposed (overlap) and the area or region in which a DL region and a UL region are superposed in the second frame of the first frame is in perforation (puncturing) structure, wherein 1 프레임의 CP의 길이와 상기 제2 프레임의 CP 길이는 서로 상이하다. The length of the CP and the CP length of the first frame of the second frame are different from each other. 바람직하게는, 상기 제1 프레임의 상기 CP 길이는 유효 심볼 길이의 1/4이고, 상기 제1 프레임의 서브프레임 개수는 상기 제2 프레임의 서브프레임의 개수보다 1개 적을 수 있다. Preferably, the CP length of the first frame is 1/4 of the effective symbol length, sub-frame number of the first frame may be one less than the number of sub-frames of the second frame. 바람직하게는, 상기 제1 프레임의 하향링크 영역과 상기 제2 프레임의 상향링크 영역이 중첩되는 경우, 상기 제1 프레임의 하향링크 서브프레임 중 마지막 서브프레임의 소정 개수의 심볼이 천공될 수 있다. Preferably, the second is when the downlink region and the uplink region of the second frame of one frame overlap, the symbols of a specified number of the last subframe of the DL subframe of the first frame may be perforated. 바람직하게는, 상기 제1 프레임의 상향링크 영역과 상기 제2 프레임의 하향링크 영역이 중첩되는 경우, 상기 제1 프레임의 상향링크 서브프레임 중 첫 번째 서브프레임의 소정 개수의 심볼이 천공될 수 있다. 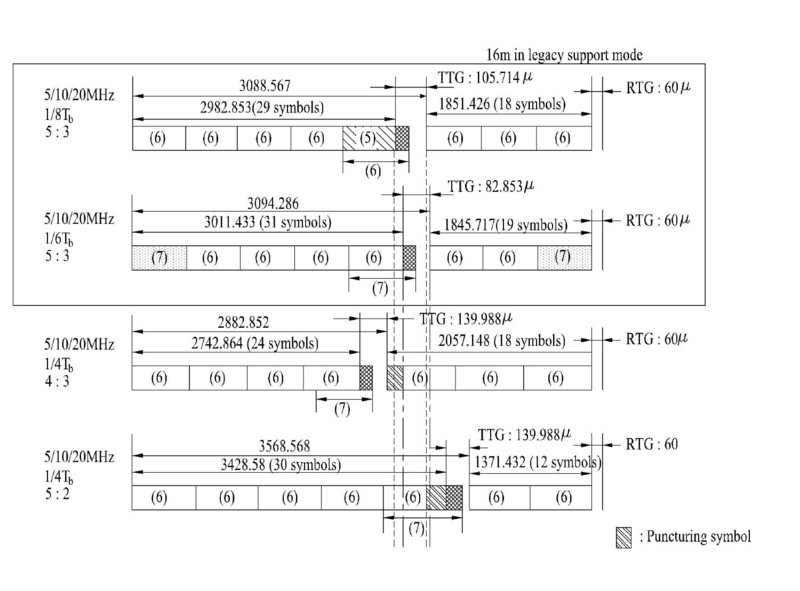 Preferably, if the uplink region and the downlink region of the second frame of the first frame overlap, the symbols of a specified number of the first subframe of the UL subframe of the first frame may be perforated . 바람직하게는, 상기 제1 프레임에서 상기 중첩되는 영역을 포함하는 서브프레임이 천공될 수 있다. Preferably, the sub-frame that includes the area in which the superposition can be punched in the first frame. 바람직하게는, 상기 제1 프레임과 상기 제2 프레임은 TDD(Time Division Duplex) 프레임일 수 있다. Advantageously, the first frame and the second frame may be (Time Division Duplex) TDD frame. 바람직하게는, 상기 방법은 상기 천공된 영역에 관한 정보를 수신하는 단계를 더 포함할 수 있다. Preferably, the method may further comprise the step of receiving information relating to the said perforated region. 바람직하게는, 상기 천공된 영역에 관한 정보는 천공된 심볼에 관한 정보 또는 천공된 서브프레임에 관한 정보일 수 있다. Preferably, the information relating to the said perforated region may be information related to the information or perforations on the perforated symbol subframe. 상기 과제를 해결하기 위한 본 발명의 다른 양상에 따른, 복수의 셀을 지원하는 무선 통신 시스템에 있어서, 사용자 기기는, 기지국으로부터 제1 프레임을 이용하여 신호를 수신하는 수신 유닛, 상기 제1 프레임을 이용하여 상기 기지국으로 신호를 전송하는 전송 유닛, 및 상기 수신 유닛 및 상기 전송 유닛을 제어하는 처리 유닛을 포함하고, 상기 시스템은 복수의 셀(cell)을 지원하며, 상기 제1 프레임은 상기 복수의 셀 중에서 제1 셀에서 지원하는 프레임이며, 상기 제1 프레임은 상기 복수의 셀 중에서 제2 셀에서 지원하는 제2 프레임과는 다른 프레임이고, 상기 제1 프레임은 상기 제1 프레임의 상향링크 영역과 상기 제2 프레임의 하향링크 영역이 중첩(overlap)되는 영역 또는 상기 제1 프레임의 하향링크 영역과 상기 제2 프레임의 상향링크 영역이 중첩 A wireless communication system supporting a plurality of cells, in accordance with another aspect of the present invention for solving the above problems, a user apparatus includes a receiving step of receiving a signal using a first frame from the base station unit, said first frame and a transmission unit, and a processing unit for controlling the receiving unit and the transmitting unit transmitting the signal to the base station, wherein the system supports a plurality of cells (cell), the first frame of the plurality of use a frame supported by the first cell in the cell, wherein the first frame and the other frame and a second frame supported by the second cell from a plurality of cells wherein the first frame is an uplink region of the first frame and the second frame of the downlink region is superimposed (overlap) to be the first region or the downlink region and the uplink region of the second frame of the frame overlapping 는 영역이 천공(puncturing)되는 구조로 되어 있고, 상기 제1 프레임의 CP의 길이와 상기 제2 프레임의 CP 길이는 서로 상이하다. This is in an area and perforation (puncturing) structure, the length of the CP length of CP of the first frame and the second frame are different from each other. 바람직하게는, 상기 제1 프레임에서, 상기 중첩되는 영역을 포함하는 서브프레임이 천공될 수 있다. Preferably, in the first frame, the sub-frame that includes the area in which the superposition can be perforated. 바람직하게는, 상기 수신 유닛은 상기 천공된 영역에 관한 정보를 수신할 수 있다. Preferably, the receiving unit may receive information about a puncturing region. 본 발명에 의할 때, 서로 다른 길이의 CP가 적용되는 프레임 사이에서, 하향링크 영역의 일부와 상향링크 영역의 일부가 중첩되는 경우, 상기 중첩되는 하향링크 영역의 일부와 상향링크 영역의 일부 중 하나의 영역을 천공함으로써, 상기 서로 다른 길이의 CP가 적용되는 프레임 사이의 간섭을 줄일 수 있다. Part of the present invention when in, each other between the different lengths of the frames CP is applied, when a portion of the part and the UL region of the DL region superimposed, upstream portion of the downlink region from the overlap and the link regions of the by boring the one area, it is possible to reduce the interference between the frame where the CP length of the different applications. 또한, 시스템에서 정의된 서브프레임을 이용함으로써, 새롭게 추가되는 서브프레임에 대한 정의가 필요하지 않다. Further, by using the sub-frame defined in the system, eliminating the need for the definition of the sub-frame to be newly added. 본 발명에서 얻을 수 있는 효과는 이상에서 언급한 효과들로 제한되지 않으며, 언급하지 않은 또 다른 효과들은 아래의 기재로부터 본 발명이 속하는 기술분야에서 통상의 지식을 가진 자에게 명확하게 이해될 수 있을 것이다. Effects that can be obtained in the present invention is not limited to the effects mentioned above, are not mentioned other effects can be clearly understood to those of ordinary skill in the art from the following description will be. 이하 본 발명에 따른 바람직한 실시형태들을 첨부된 도면을 참조하여 상세하게 설명한다. With reference to the accompanying drawings, the preferred embodiment according to the present invention will be described in detail. 첨부된 도면과 함께 이하에 개시되는 상세한 설명은 본 발명의 예시적인 실시형태를 설명하고자 하는 것이며, 본 발명이 실시될 수 있는 유일한 실시형태를 나타내고자 하는 것이 아니다. The detailed description given below with reference to the accompanying drawings, is intended to explain exemplary embodiments of the present invention, rather than to show the only embodiments in which the invention may be practiced. 이하의 상세한 설명은 본 발명의 완전한 이 해를 돕기 위해 구체적인 세부사항을 포함한다. The following detailed description includes specific details in order to provide a thorough the solution of the present invention. 그러나, 당업자는 본 발명이 이러한 구체적 세부사항 없이도 실시될 수 있음을 알 것이다. However, those skilled in the art will appreciate that this may be practiced without these specific detail about the present invention. 예를 들어, 이하의 설명에서 일정 용어를 중심으로 설명하나, 이들 용어에 한정될 필요는 없으며 임의의 용어로서 지칭되는 경우에도 동일한 의미를 나타낼 수 있다. For example, a description is made of a constant term in the following description, it is not necessarily limited to these terms may exhibit the same means, even when referred to as any of the terms. 또한, 본 명세서 전체에서 동일하거나 유사한 구성요소에 대해서는 동일한 도면 부호를 사용하여 설명한다. For the addition, the same or similar elements throughout the specification will be described using the same reference numerals. 명세서 전체에서, 어떤 부분이 어떤 구성요소를 "포함"한다고 할 때, 이는 특별히 반대되는 기재가 없는 한 다른 구성요소를 제외하는 것이 아니라 다른 구성요소를 더 포함할 수 있는 것을 의미한다. In the specification, assuming that any part "includes" a certain component, which is not to exclude other components not specifically described against which means that it is possible to further include other components. 본 발명의 실시예들은 무선 접속 시스템들인 IEEE(Institute of Electrical and Electronics Engineers) 802 시스템, 3GPP 시스템, 3GPP LTE(3rd Generation Partnership Project Long Term Evolution) 시스템 및 3GPP2 시스템 중 적어도 하나에 개시된 표준 문서들에 의해 뒷받침될 수 있다. Embodiments of the present invention by standard documents disclosed in at least one of (Institute of Electrical and Electronics Engineers) IEEE, which are wireless access system 802 system, 3GPP system, 3GPP LTE (3rd Generation Partnership Project Long Term Evolution) system, and 3GPP2 system It can be supported. 즉, 본 발명의 실시예들 중 본 발명의 기술적 사상을 명확히 드러내기 위해 설명하지 않은 단계들 또는 부분들은 상기 문서들에 의해 뒷받침될 수 있다. That is, the embodiments of the description are not to clearly reveal the spirit steps or parts of the invention of the present invention can be supported by the above documents. 또한, 본 문서에서 개시하고 있는 모든 용어들은 상기 표준 문서에 의해 설명될 수 있다. In addition, all the terms disclosed in the present document may be described by the above standard documents. 특히, 본 발명의 실시예들은 IEEE 802.16 시스템의 표준 문서인 P802.16-2004, P802.16e-2005 및 P802.16Rev2 등의 문서에 의해 뒷받침될 수 있다. In particular, embodiments of the present invention can be supported by standard documents such as documents of P802.16-2004, P802.16e-2005 and P802.16Rev2 of IEEE 802.16. 이하의 설명에서 사용되는 특정 용어들은 본 발명의 이해를 돕기 위해서 제공된 것이며, 이러한 특정 용어의 사용은 본 발명의 기술적 사상을 벗어나지 않는 범위에서 다른 형태로 변경될 수 있다. Specific terms used in the description below are provided to aid the understanding of the present invention, the use of such specific terms may be modified within the scope and spirit of the invention in other forms. 무선 통신 시스템에서 다중 반송파 변조방식인 직교 주파수 분할 다중(OFDM: Orthogonal Frequency Division Multiplexing)의 기본원리를 설명하면 다음과 같다. Multi-carrier modulation scheme is orthogonal frequency division multiplexing in a wireless communication system will be described the basic principles of (OFDM Orthogonal Frequency Division Multiplexing) as follows. OFDM 시스템에서 고속 전송률(high-rate)을 갖는 데이터 스트림(data stream)을 낮은 전송률(slow-rate)을 갖는 많은 수의 데이터 스트림으로 나누는데, 이는 다수의 반송파를 사용하여 동시에 전송하려는 것이다. Divide a data stream (data stream) having a high-speed transfer rate (high-rate) in the OFDM system with a large number of data streams that has a lower rate (slow-rate), which is to transmit using multiple carriers at the same time. 이러한 다수의 반송파 각각을 부반송파(subcarrier)라 한다. These multiple carriers, each sub-carrier is referred to as (subcarrier). OFDM 시스템에서 다수의 반송파 간에 직교성(orthogonality)이 존재하기 때문에, 반송파의 주파수 성분은 상호 중첩되어도 수신단에서의 검출이 가능하다. Due to the orthogonality (orthogonality) exists between multiple carriers in an OFDM system, the frequency component of the carrier wave may be mutually superposed can be detected at the receiving end. 고속 전송률을 갖는 데이터 스트림은 직/병렬 변환부(Serial to Parallel converter)를 통해 다수의 낮은 전송률의 데이터 스트림(data stream)로 변환되고, 병렬로 변환된 다수의 데이터 스트림에 각각의 부반송파가 곱해진 후 각각의 데이터 스트림이 합해져서 수신단으로 전송될 수 있다. A data stream having a higher transfer rate is made, converted into a data stream (data stream) of a plurality of low bit rate via a serial / parallel converter (Serial to Parallel converter), each sub-carrier is multiplied by a number of data streams converted in parallel, then it may be sent to the receiver combine the respective data streams. 직/병렬 변환부에 의해 생성된 다수의 병렬 데이터 스트림은, 역 이산 푸리에 변환(IDFT: Inverse Discrete Fourier Transform)에 의하여 다수의 부반송파로 전송될 수 있다. Series / plurality of parallel data streams generated by the parallel converter, the inverse discrete Fourier transform: it can be transmitted to the plurality of sub-carriers by (IDFT Inverse Discrete Fourier Transform). 이때, IDFT는 역 고속 푸리에 변환(IFFT; Inverse Fast Fourier Transform)을 사용하여 효율적으로 구현될 수 있다. At this time, IDFT is the inverse fast Fourier transform; using (IFFT Inverse Fast Fourier Transform) can be efficiently implemented. 낮은 전송률을 갖는 부반송파의 심볼 주기(symbol duration)가 증가하게 되므로 다중경로 지연확산에 의해 발생하는 시간상에서의 상대적인 신호 분산(dispersion)이 감소한다. Increases the symbol period of the sub-carriers having the low bit rate (symbol duration) decreases so that the relative signal dispersion (dispersion) on a time caused by multipath delay spread. 이러한 OFDM 방식을 이용한 무선 통신에서, 심볼 간 간섭(Inter-Symbol Interference)을 줄이기 위하여 심볼 사이에 채널의 지연 확산보다 긴 보호구간(guard interval)을 삽입할 수 있다. In the wireless communication using this OFDM method, the symbol to-interference (Inter-Symbol Interference) longer guard interval than the delay spread of the channel between the symbols to reduce can insert (guard interval). 즉, 각 심볼이 다중경로 채널을 통해 전송되는 동안, 연속된 심볼 사이에 채널의 최대 지연확산(Delay Spread)보다 긴 보호구간(Guard Interval)을 삽입한다. That is, each symbol is inserted into the long guard interval (Guard Interval) than the maximum delay spread (Delay Spread) in the channel between consecutive symbols during transmission through a multipath channel. 이때, 부반송파 간의 직교성(Orthogonality) 파괴를 방지하기 위해 유효 심볼 구간의 마지막 구간(즉, 보호구간)의 신호를 복사하여 심볼의 앞 부분에 삽입한다. In this case, by copying the signal of the last interval of a valid symbol interval (that is, the guard period) to prevent the orthogonality (Orthogonality) destruction between the sub-carriers are inserted at the beginning of the symbol. 이를 순환 전치부(CP: cyclic prefix, 이하 CP라고 칭한다)라 부른다. This cycle prefix: referred to as (CP cyclic prefix, hereinafter referred to as CP). 도 5는 CP(cyclic prefix)를 포함하는 심볼 구조의 일 예를 나타내는 도면이다. 5 is a view of an example of the symbol structure including a (cyclic prefix) CP. 도 5를 참조하면, 심볼 주기(Ts)는 실제 데이터가 전송되는 유효 심볼 구간(T b )과 보호구간(T g )의 합이 된다. 5, the symbol period (Ts) is the sum of the useful symbol interval (T b) and a guard interval (T g) that is the actual data is transmitted. 수신단에서는 보호구간을 제거한 후 유효 심볼 구간 동안의 데이터를 취하여 복조를 수행하게 된다. In the receiving end after removing the guard interval it is performed by taking the demodulated data for the valid symbol interval. 송신단 및 수신단은 순환전치 부호를 사용하여 서로 동기화를 이룰 수 있으며, 데이터 심볼간 직교성을 유지할 수 있다. The transmitting end and the receiving end, and to achieve synchronization with each other by using the cyclic prefix code, it is possible to maintain the orthogonality between the data symbols. 본 발명에서 말하는 심볼은 OFDMA 심볼일 수 있다. Symbols according to the present invention may be in the OFDMA symbol. 이하에서 8.75MHz의 채널 대역폭에서 유효 심볼 길이의 1/4에 해당하는 CP 길이(이하에서는 1/4 T b 의 CP 길이라고 칭할 수 있다)를 가지는 IEEE 802.16m 시스템에서의 프레임(TDD 프레임 및 FDD 프레임)에 대하여 설명하기로 한다. CP length in a channel bandwidth of 8.75MHz below corresponding to 1/4 of the effective symbol length (hereinafter may be referred to as 1/4 CP length T b) of the frame in the IEEE 802.16m system having (TDD and FDD frame It will be described with respect to the frame). 또한, 동일한 8.75MHz의 채널 대역폭에 대하여 1/8 T b 의 CP 길이 또는 1/16 T b 의 CP 길이를 가지는 TDD 프레임과 상호 공존할 수 있는 TDD 프레임에 대해 설명할 것이다. In addition, a description will be given for TDD frames to coexist with TDD frame having a CP length of 1/16 or CP length of 1/8 T b T b with respect to the channel bandwidth of 8.75MHz same. 또 한, 본 발명에서 제안하는 TDD 프레임과 많은 공통성을 지니는 FDD 프레임도 함께 설명할 것이다. Another, FDD frame having a number of TDD frames and commonality proposed by the present invention will be described together. IEEE 802.16m 시스템에는 4가지 형태의 서브프레임이 존재한다. IEEE 802.16m system, there are four types of sub-frames. 제 1 타입은 6개의 OFDMA 심볼로 구성된 서브프레임이고, 제 2 타입 서브프레임은 7개의 OFDMA 심볼로 구성된 서브프레임, 제 3 타입 서브프레임은 6개의 OFDMA 심볼로 구성된 서브프레임, 제 4 타입 서브프레임은 9개의 OFDMA 심볼로 구성된 서브프레임으로 정의할 수 있다. The first type is a sub-frame consisting of 6 OFDMA symbols, the second type sub-frame is a sub frame, the third type sub-frame is a sub frame, the fourth type sub-frame consists of six OFDMA symbols consisting of 7 OFDMA symbols It can be defined as a sub-frame consisting of nine OFDMA symbols. 이때, 제 4 타입 서브프레임은 8.75MHz 채널 대역폭에서의 프레임에서 이용될 수 있다. At this time, the fourth type sub-frame can be used in the frame in 8.75MHz bandwidth channel. 이하에서는, 5, 10, 20, 7, 8.75MHz 대역에서 유효 심볼 길이의 1/4에 해당하는 CP 길이(이하, 1/4 T b 의 CP 길이라 칭하기로 함)를 가지는 TDD 프레임과 동일한 대역에 대하여 유효 심볼 길이의 1/8에 해당하는 CP 길이(이하, 1/8T b 의 CP 길이라 칭하기로 함)와 유효 심볼 길이의 1/16(이하, 1/16T b 의 CP 길이라 칭하기로 함)를 가지는 TDD 프레임간의 상향링크 대 하향링크의 비율에 따른 프레임 정렬(alignment)을 맞추기 위한 방법을 설명하기로 한다. The same band and the TDD frame has a, 5, 10, 20, (referred to hereinafter, referred to as a CP length of 1/4 T b) 7, the effective symbol length 1/4 the length of the CP in 8.75MHz bandwidth Hereinafter with respect to the effective symbol length of the CP length, it will be referred to as a (hereinafter, 1 / 8T b in a way referred to as a CP hereinafter) and a CP length of 1/16 of the effective symbol (hereinafter, 1 / 16T b road corresponding to 1/8 It will be described a method for fitting a frame alignment (alignment) according to the ratio of the uplink for downlink between the TDD frame having a box). 1/4 T b 의 CP 길이를 가지는 IEEE 802.16m 시스템의 TDD 프레임은 다른 CP 길이를 가진 프레임과 동일한 개수의 서브프레임으로 구성될 수 있지만, 기본 서브프레임인 제1 타입 서브프레임을 많이 사용하기 위해서는 기존에 정의된 프레임의 서브프레임의 개수보다 한 개 적은 개수의 서브프레임을 사용하여 프레임을 구성할 수 있다. 1/4 of the IEEE 802.16m system having a CP length of T b TDD frame may be composed of the same number of sub-frames and frames having different CP lengths, to use a lot of the primary sub-frame of the first type sub-frame you can form a frame using one or a small number of sub-frames than the number of sub-frames of a frame defined in the existing. 예를 들어, 5, 10, 20 MHz 대역에서 1/8T b 의 CP 길이와 1/16T b 의 CP길이를 가지는 프레임에서 하나의 프레임은 8개의 서브프레임프레임으로 구성되지만, 1/4 T b 의 CP 길이를 갖는 프레임구조는 7개의 서브프레임프레임으로 프레임을 구성한다. For example, 5, in a frame having a CP length of 10, 20 MHz band, 1 / 8T b of the CP length and 1 / 16T b in one frame is constituted by eight sub-frames, a 1/4 T b a frame structure having a CP length constitutes a frame into seven subframes frame. 동일한 대역에 대하여 1/4 T b 의 T b of 1/4 with respect to the same band, CP 길이를 갖는 프레임은 상기 1/4 T b 의 A frame having a CP length is 1/4 of the T b CP 길이와 다른 길이의 CP를 갖는 기존의 프레임에서의 서브프레임의 개수와 서로 다른 개수의 서브프레임을 이용하여 프레임을 구성하기 때문에, 1/4 T b 의 Because of using the sub-frame number and a different number of sub-frames in the conventional frame having a CP length of CP with different lengths to a frame, the 1/4 T b CP 길이를 갖는 프레임과 상기 1/8T b 의 CP 길이를 갖는 프레임 간에 또는 1/4 T b 의 From frame to frame with a CP length of a frame having a CP length and the 1 / 8T b or 1/4 of the T b CP 길이를 갖는 프레임과 1/16T b A frame having a CP length and 1 / 16T b CP 길이를 갖는 프레임 간에 상향링크 영역의 일부와 하향링크 영역의 일부가 중첩되어, 서로 간섭을 일으킬 수 있다. A part with a portion of the DL region of the UL region between a frame having a CP length of overlap, can cause interference to each other. 예를 들어, 1/4 T b 의 CP 길이와 1/8 T b 의 CP 길이와 1/16 T b 의 CP 길이가 동시에 사용되는 경우, 즉, 하나의 매크로 셀(Macro-cell)에서는 1/4 T b 의 CP 길이를 갖는 프레임을 사용하여 신호를 전송하고 있고 해당 셀 안에 존재하는 피코셀(Pico-cell)이나 펨토셀(Femto-cell) 또는 릴레이(relay)등에서는 1/8T b 의 CP 길이나 1/16T b For example, if 1/4 of the CP length T b T b 1/8 and a CP length of CP length of 1/16 and T b are used at the same time, that is, one macro-cell (Macro-cell) in the first 1 / 4 using a frame having a CP length of T b transmit signals to and have etc. the pico cells existing in the cell (Pico-cell) or femtocells (Femto-cell) or a relay (relay) is 1 / 8T b of CP way or 1 / 16T b 의 CP의 길이를 갖는 프레임을 사용하여 신호를 전송하는 경우에, 상기 매크로 셀에서 사용하는 프레임의 상향링크 및 하향링크의 전환점과 상기 피코셀이나 펨토셀 또는 릴레이에서 사용하는 프레임의 상향링크 및 하향링크의 전환점이 서로 일치하지 않을 수 있다. In the case of transmitting signals using a CP frame having a length of, uplink and downlink frame used in the switch points and the picocell or femtocell or relay the uplink and downlink of a frame used in the macrocell the turning point may not coincide with each other. 그 결과, 매크로 셀의 상향링크 전송 영역과 상기 피코셀이나 펨토셀 또는 릴레이의 하향링크 전송 영역이 중첩되거나, 매크로 셀의 하향링크 전송 영역과 상기 피코셀이나 펨토셀 또는 릴레이의 상향링크 전송영역이 서로 중첩되어 간섭을 일으킬 수 있다. As a result, the uplink region and the downlink transmission area of ​​the picocell or femtocell or relays the macrocells overlap or, a DL transmission zone and an uplink transmission area of ​​the picocell or femtocell or relays the macrocells overlap each other there is cause interference. 또한, 또 다른 예로서, 인접한 셀간의 CP 길이가 다른 경우(예를 들어, 1/4 T b 의 CP 길이와 1/8 T b 의 CP 길이 또는 1/4 T b 의 CP 길이와 1/16 T b 의 CP 길이)에, 두 셀 간의 경계 지역에 위치하는 단말의 경우에, 상기 두 셀에서 사용하는 프레임의 상향링크 및 하향링크 전환점이 서로 일치하지 않을 수 있다. In yet another example, in the case where the CP length between the other adjacent cells (e.g., 1/4 CP length of CP length of 1/8 T b and T b of the CP length of 1/4 or 1/16 and T b in the case of a terminal located in, in the boundary region between the two cell CP length T b), there is a turning point of the uplink and downlink frame used in the two cells may be inconsistent with one another. 그 결과, 인접한 셀 간의 상향링크 전송 영역과 하향링크 전송 영역이 서로 중첩되어 서로 간섭을 일으킬 수 있다. As a result, the uplink transmission region between adjacent cells and downlink transmission regions are overlapped with each other may cause interference to each other. 또한 두개의 인접 케리어를 통한 다중 캐리어(multi-carrier)를 지원하는 상황에서 각 케리어에서 사용하는 CP의 길이가 다른 경우(예를 들어, 1/4 T b 의 CP 길이와 1/8 T b 의 CP 길이 또는 1/4 T b 의 CP 길이와 1/16 T b 의 CP 길이)에 인접한 케리어에서 사용하는 프레임의 상향링크 및 하향링크 전환점이 일치하지 않아 상향 링크 영역과 하향링크 영역이 서로 중첩되어 서로 간섭을 일으킬 수 있다. In addition, two adjacent cases in the context of supporting a multi-carrier (multi-carrier) with the length of the CP carrier used in each carrier other (for example in, 1/4 of the CP length T b and T b 1/8 CP length of 1/4 or 1/16 and T b CP length T CP length b) the uplink and downlink switch points of a frame used by the carrier does not match the uplink and the downlink region adjacent to the region are overlapped with each other It may cause interference with each other. 따라서, 상기 문제를 해결하기 위하여 상기 1/4 T b 의 CP 길이를 갖는 프레임의 하향링크 및 상향링크 전환점과 상기 1/4 T b 의 CP 길이와 다른 CP 길이를 갖는 프레임의 하향링크 및 상향링크 전환점의 정렬이 맞지 않아, 상기 1/4 T b 의 CP 길이 를 갖는 프레임의 하향링크 영역 또는 상향링크 영역에서 상기 1/4 T b 의 CP 길이와 다른 CP 길이를 갖는 프레임의 상향링크 영역 또는 하향링크 영역과 중첩되는 일부의 심볼 또는 서브프레임을 천공(puncturing)하여 프레임 간의 간섭을 방지하는 방법을 제안한다. Thus, the downlink and uplink of the frame having a CP length of CP and the other 1/4 of the length T b of the downlink and uplink switch points of a frame having a CP length and the 1/4 T b In order to solve the problem does not match the alignment of the turning point, the 1/4 T b uplink region of the frame having a CP length of CP and the other 1/4 of the length T b in the downlink region, or an uplink region of the frame having a CP length of downlink or perforation (puncturing) a part of the symbols or subframes overlapping the link region to propose a method for preventing interference between the frames. CP 길이가 서로 상이한 프레임간의 하향링크 영역과 상향링크 영역의 중첩에 의한 간섭을 없애기 위하여, 중첩되는 하향링크 영역과 상향링크 영역 중 하나의 영역을 천공하는 경우를 상세히 설명하면 다음과 같다. If the CP length is described in detail the case of the perforated region of one of the DL region and a UL region, the overlap in order to eliminate the interference caused by superposition of a DL region and a UL region are different from each other between a frame as follows. 하향링크 영역에서 1개의 심볼을 천공하는 경우, 중첩된 영역을 없애기 위해서 하나의 심볼(마지막 하향링크 서브프레임의 마지막 심볼)을 천공하기 때문에, 서브프레임프레임의 타입이 심볼이 하나 줄어든 형태의 서브프레임프레임 타입으로 변경된다. When puncturing the first symbol in the downlink region, one of the symbols in order to eliminate the overlap region (last DL subframe the last symbol of the frame), the perforations to a result, the sub-frame type is a symbol is a reduced form of a sub-frame of the It is changed to frame type. 예를 들어 하향링크 마지막 서브프레임이 6개의 심볼로 구성된 제1 타입 서브프레임인 경우, 5개의 심볼로 구성된 제3 타입 서브프레임으로 변경되고, 제2 타입 서브프레임인 경우, 제1 타입 서브프레임으로 변경된다. For the case example of a downlink last sub-frame is the case of the first type sub-frame consisting of six symbols is changed to the third type sub-frame consisting of five symbols, the second type sub-frame, the first type sub-frame It is changed. 하향링크 영역에서 2개 이상의 심볼을 천공하여야 하는 경우, 천공된 서브프레임프레임이 4개 이하의 심볼로 구성되는 경우 4개의 심볼로 구성된 새로운 타입의 서브프레임프레임을 생성하지 않기 위하여 해당 서브프레임프레임을 천공하여 프레임 정렬을 맞출 수 있다. When required puncturing at least two symbols in the downlink region, the sub-frame to the case where the drilling sub-frame consisting of symbols of 4 or less does not produce a new type of sub-frame composed of four symbols drilling can be adjusted by the frame alignment. 또한 천공된 심볼을 제외하고 남은 심볼들로 서브프레임을 재구성하여 프레임 정렬을 맞출 수 있다. In addition, it is possible to exclude the punctured symbols and reconstruct the sub-frame with the remaining symbols fit the frame alignment. 한편, 하향링크에서 심볼의 천공 또는 서브프레임의 천공을 이용하여 서로 다른 CP 길이를 가지는 프레임 간의 간섭을 없애고 프레임 정렬을 맞추는 것과 같이 상향링크 영역에서도 하향링크 영역과 중첩되는 심볼 혹은 서브프레임프레임에 대한 천공을 수행함으로써 다른 CP간의 프레임 정렬을 맞출 수 있다. On the other hand, by using a perforated or punched subframe symbols to each other on different symbols or sub-frame is overlapped with the DL region in the UL region as to eliminate interference fit the frame alignment between a frame having a CP length in downlink by performing the drilling can be adjusted for frame alignment between the different CP. 그리고 천공된 심볼을 제외하고 남은 심볼들로 서브프레임을 재구성하여 프레임 정렬을 맞출 수 있다. And except for the punctured symbols and reconstruct the sub-frame with the remaining symbols can be adjusted to the frame alignment. 상향링크 영역의 첫 번째 서브프레임의 첫 심볼을 천공하는 경우, 하나의 심볼이 줄어든 서브프레임프레임 타입으로 변경되며(제1 타입 서브프레임은 제3 타입 서브프레임으로 변경되고, 제2 타입 서브프레임은 제1 타입 서브프레임으로 변경) 이때 기존 서브프레임프레임에서 첫 심볼을 사용하지 않은 새로운 타입의 서브프레임프레임이 구성된다. When puncturing the first symbol of the first subframe of the UL region, change in one subframe frame type symbols are reduced and (the first-type sub-frame is changed to the third type sub-frame, a second type sub-frame the changes in the first type sub-frame). at this point, a new type of sub-frames not used for the first symbol in the previous sub-frame is configured. 도 6은 본 발명의 일 실시예에 따른 프레임 간의 간섭을 없애기 위하여 서브프레임프레임의 첫 심볼이 천공될 때 생성되는 서브프레임프레임의 구조를 도시한 도면이다. Figure 6 is a diagram showing a structure of a sub-frame that is generated when the first symbol of a sub-frame to be perforated in order to eliminate the interference between the frames according to one embodiment of the present invention. 상기 도 6에 도시된 바와 같이, 상향링크 영역에서 제1 타입 서브프레임이 아닌 5개의 심볼로 구성된 제3 타입 서브프레임을 이용하여 구성된 제3 타입 서브프레임을 이용하여 상향링크 제어 채널을 구성할 수 있다. As it described above, illustrated in Figure 6, using a third type sub-frame consisting of five symbols than the first type sub-frame in the UL region to configure the third type sub-frame used to up-link control channel is configured have. 이때 기존의 서브프레임프레임에서 하나의 심볼이 천공되었기 때문에 상향링크 제어 채널에서 해당 심볼을 제외한 나머지 심볼만을 이용하거나 천공된 심볼을 포함한 미니 타일(mini-tile)을 제외한 나머지 미니 타일을 이용하여 상향링크 제어 채널로 이용할 수 있다. Using only the remaining symbols except for the symbol in uplink control channel, or using the remaining mini-tiles, except for a mini tile (mini-tile) including a perforated symbol uplink case because the one of the symbols punctured from the previous sub-frame It can be used as a control channel. 예를 들어 상향링크 제어 채널(Uplink control channel)은 기본적으로 6개의 연속 된(consecutive) 부반송파(subcarrier)와 6개의 심볼로 구성되며 이때 피드백 제어 채널(feedback control channel)은 2개의 연속된 부반송파와 6개의 심볼로 구성된 3개의 상향링크 피드백 미니타일(Feedback Mini-Tile: FMT)로 구성된다. For example, the uplink control channel (Uplink control channel) basically consists of the six continuous (consecutive) subcarriers (subcarrier) and six symbols The feedback control channel (feedback control channel) are two consecutive sub-carriers and 6 It consists of: (FMT Feedback Mini-tile) 3 of the uplink feedback mini-tile consisting of symbols. 또한 상향링크 HARQ 피드백 채널의 경우 2개의 연속된 부반송파와 2개의 심볼로 구성된 상향링크 HARQ 미니 타일(HARQ Mini-Tile: HMT)으로 구성된다. Also, for an uplink HARQ feedback channel two uplink consisting of consecutive subcarriers and the two symbols HARQ mini-tile: consists of (HARQ Mini-Tile HMT). 따라서 빠른 피드백 제어 채널의 경우 FMT에서 천공된 한 심볼을 제외한 나머지 심볼을 이용하며 HARQ의 경우에는 HMT에서 천공된 심볼이 포함된 미니타일을 제외한 나머지 HMT를 이용한다. Thus, for fast feedback control channel using the remaining symbols except for the symbols punctured from the FMT and, in the case of HARQ is used for the rest of HMT except for the mini-tile it includes a perforated symbol in HMT. 프레임의 상향링크 및 하향링크 영역에서 다른 CP 길이를 가지는 프레임과 중첩되는 부분에 대한 서브프레임프레임 또는 심볼의 천공에 대한 정보는 기지국에서 SFH(Super Frame Header), A-MAP(Advanced-MAP), ABI(Additional Broadcast Information) 혹은 하향링크 메시지를 통하여 전달된다. Information on the puncturing of the sub-frame or symbol for a portion in the up-link and down-link region of the frame overlap with the frame having a different CP length (Super Frame Header) from the base station SFH, A-MAP (Advanced-MAP), (Additional Information Broadcast) or ABI is transmitted through the downlink message. 상기 ABI는 SFH로 전송하지 못하는 필요한 추가적인 정보가 있는 경우, 상기 정보를 전송하기 위하여 사용된다. The ABI is used to if the additional information does not need to SFH transmission, transmitting the information. 이러한 하향링크 제어 메시지를 통하여 전송되는 정보는 상향링크 또는 하향링크의 천공된 서브프레임프레임 인덱스(index), 상향링크 또는 하향링크의 천공된 심볼 인덱스, 상향링크 또는 하향링크의 천공된 서브프레임 또는 심볼의 개수, 상향링크 또는 하향링크의 서브프레임 또는 심볼의 위치와 프레임 구성(configuration)에 관한 정보의 조합으로 이루어진다. The information transmitted through the downlink control message is a UL or DL ​​perforated the sub-frame index (index), UL or DL ​​puncturing symbol index, UL or perforated sub-frame or symbol of a down link of is a combination of information about the number, the up-link, the location and configuration of a frame or sub-frame symbol of the DL (configuration). 도 7 내지 도 9는 본 발명의 일 실시예에 따른 각 대역에서 1/4 T b 의 CP 길 이를 가지는 프레임과 1/4 T b 의 CP 길이와 다른 CP 길이를 가지는 프레임 간의 하향링크 및 상향링크 영역에서 중첩되는 심볼 혹은 서브프레임프레임을 천공하는 프레임을 도시한 도면이다. 7 to 9 are the downlink and uplink between the frame having a CP length of CP and the other length of each band in accordance with an embodiment of the invention T b 1/4 of the CP this way with a frame and T b 1/4 a diagram illustrating a symbol or a frame perforation the sub-frame to be superimposed on the zone. 특히, 도 7은 5, 10, 20 MHz 대역에서 1/4 T b 의 CP 길이의 프레임과 다른 CP길이의 프레임이 함께 사용될 경우, 상기 두 프레임의 간섭을 없애기 위하여 1/4 T b 의 CP 길이의 프레임에서 상기 다른 CP 길이의 프레임과 중첩되는 심볼을 천공한 프레임을 도시한 도면이다. In particular, Figure 7 is 5, 10, 20 MHz when used in the range of 1/4 T b with the frame of the frame and the other CP length of CP length, the two CP length of 1/4 T b in order to eliminate the interference of the frame in the frame a view showing one frame are punctured symbols, frames and overlap of the different CP lengths. 이때, 다른 CP를 가지는 프레임의 하향링크 대 상향링크의 비율(ratio)은 5:3이다. In this case, the proportion (ratio) of the downlink for the uplink of the frame have different CP is 5: 3. 여기서 1/4 T b 의 CP 길이의 프레임의 하향링크 대 상향링크의 비율(ratio)가 5:2인 경우 1/4 T b 의 CP 길이의 하향링크 영역이 다른 CP 프레임의 상향링크 영역과 중첩되어 간섭이 발생한다. Where T b 1/4 ratio of the DL for UL of the frame of the CP length (ratio) of 5: 2 when 1/4 of the DL region of the CP length T b overlaps with the UL region of the other frame CP It is the interference occurs. 이때 1/4 T b 의 CP 길이의 프레임의 하향링크 영역에서 다른 CP의 길이(1/8T b 의 CP 길이나 1/16T b 의 CP 길이)의 프레임의 상향링크 영역에서의 중첩을 피하기 위하여 1/4 T b 의 CP 길이의 마지막 서브프레임에서 중첩된 영역에 해당하는 영역(여기서 중첩된 영역 이외에도 1/2 RTD(Round Trip Delay)도 고려함)을 고려하여 해당하는 영역만큼의 심볼을 천공하여 다른 CP 길이를 가지는 프레임구조와 하향링크 및 상향링크 정렬을 맞추어서 다른 CP 길이를 갖는 프레임과의 간섭을 줄일 수 있다. The 1/4 in order to avoid overlap in the uplink region of the frame in DL region of the frame of the CP length of the T-length b of the other CP (1 / CP length and the CP length of 1 / 16T b of 8T b) 1 / 4 T b CP-length region corresponding to the last subframe in the overlap region of the (where addition to the overlapped area 1/2 Round Trip Delay (RTD) also taking into account) to the punctured symbols in the corresponding area by other considerations conformity to the frame structure and the downlink and uplink aligned with the CP length can reduce the interference with the frame having a different CP length. 위의 경우에는 중첩된 영역을 고려할 때 적어도 3개의 심볼을 천공하거나 중첩되는 서브프레임을 천공하여 다른 CP 프레임과의 간섭을 줄일 수 있다. In the above case, when considering the overlapped area can be perforated by a sub-frame that is punctured or overlap at least three symbols to reduce interference with other CP frame. 여기서 천공하는 심볼의 개수는 CP 길이에 상관 없이 동일하게 적용된다. The number of symbols punctured herein applies equally regardless of the CP length. 상기 도 7에 도시된 바와 같이, 1/4 T b 의 CP 길이의 프레임의 하향링크 대 상향링크의 비율이 4:3인 경우 다른 CP 길이의 프레임의 하향링크 영역과 1/4 T b 의 CP 길이의 프레임의 상향링크 영역의 중첩(overlap)되는 부분이 발생한다. As described above, illustrated in Figure 7, the DL ratio of the uplink of the CP length of 1/4 T b Frame 4: 3 In the case of another CP length of a frame of the downlink region and b T 1/4 CP the superposition (overlap) that is part of the UL region of the length of the frame occurs. 따라서 이러한 중첩을 방지하기 위하여 1/4 T b 의 CP 길이의 프레임의 상향링크 영역에 존재하는 중첩되는 심볼을 천공함으로써, 두 프레임간의 간섭을 방지할 수 있다. Thus, by boring the overlapping symbols present in the UL region of the CP length of 1/4 T b frames to avoid this overlap, it is possible to prevent the interference between the two frames. 이때 1/4 T b 의 CP 길이의 프레임의 상향링크 영역에서 천공되는 심볼의 개수는 1/8T b 의 CP길이의 프레임과 사용되는 경우 한 개이며, 1/16T b 의 CP 길이의 프레임과 사용되는 경우에는 두 개이다. The fourth number of symbols punctured in the uplink region of the frame of the CP length T b is one when used with a CP length of 1 / 8T b frames, the use of the CP length of 1 / 16T b If there are two atoms. 그리고 천공되는 심볼은 상향링크 영역의 첫 번째 서브프레임에 위치한다. And symbols to be punctured is located at the first subframe of a UL region. 이렇게 다른 CP 길이를 가진 프레임간의 프레임 정렬을 맞추고 프레임 간에 간섭을 줄이기 위해 수행하는 천공에 관한 정보는 프레임에서 전송되는 SFH, A-MAP 또는 제어정보를 이용하여 정보를 이용하여 알려주게 된다. This information about the puncturing align the frame alignment between the frames with different CP length to perform in order to reduce interference between the frames is by using a SFH, A-MAP or control information to be transmitted in the frame, let me know by using the information. 천공되는 심볼의 개수는 2비트(bit) 내지 3비트의 정보를 이용하여 전송되며 천공에 관한 정보에는 심볼 수 및 심볼의 위치(하향링크 또는 상향링크 영역에 대한 통지, 서브프레임프레임 통지)등이 포함되며 이러한 정보들은 같이 혹은 따로 전송될 수 있다. The number of symbols to be punctured are sent using two bits of information (bit) to 3-bit information in the puncturing, the (notification, the sub-frame notification of the downlink or uplink area) of the location of the number of symbols and the symbol and it includes this information may be transmitted separately or as. 서브프레임프레임이 천공되는 경우에는 유휴(idle) 상태라는 통지를 하거나 또는 사용하지 않는 서브프레임프레임이라는 통지를 하거나, SFH 혹은 A-MAP을 통하여 새로운 프레임 구성 정보를 전송할 수 있다. If the sub-frame the frame is punctured, the notification of the notification that an idle (idle) state or not the sub-frame that is used, or may send a new frame configuration information through the SFH or A-MAP. 상기 도 7은 사용 가능한 하향링크 대 상향링크의 비율이 5:3인 경우에 대한 예를 들고 있지만, 다른 하향링크 대 상향링크 비율(예를 들어, 2:6, 3:5, 4:4, 6:2 등)의 경우에도 마찬가지로 상기에서 언급한 천공을 적용하여 다른 CP 길이를 가진 프레임 간의 간섭을 제거할 수 있다. FIG 7 is enabled downlink ratio of the uplink 5: While holding the example of the case 3, and the other downlink versus uplink ratio (e. G., 2: 6, 3: 5, 4: 4, 6: it is possible to apply the perforations mentioned above to remove the interference between frames with different CP length Similarly, if the second, and so on). 또한 다른 CP 프레임과의 중첩을 방지하며 프레임 정렬을 맞추기 위해서 1/4 T b 의 CP 길이의 프레임에서 수행한 하향링크 또는 상향링크 심볼의 천공은 1/4 T b 의 CP 길이의 프레임과 맞추기 위하여 다른 CP 프레임에(예를 들어, 1/8T b 의 CP 길이의 프레임 또는 1/16T b 의 CP 길이의 프레임)에서도 수행될 수 있으며 이때 천공되는 심볼의 개수는 CP 길이에 따라 심볼의 길이가 서로 다르므로 위에서 설명한 심볼의 수와 같거나 다를 수 있다. In addition, the perforations in the downlink or uplink symbol carried out at the CP length of 1/4 T b the frame to fit the frame alignment, and avoid overlap with other CP frame to fit the frame of the CP length of 1/4 T b on the other CP frames can be performed in the (e.g., 1 / 8T b of the CP length frame or a 1 / 16T b-frame of the CP length of a), and each other wherein lengths of the symbols with the number of symbols to be punctured is the CP length varies may be the same as or different from the number of symbols as described above. 도 8은 8.75MHz 대역에서 1/4 T b 의 CP 길이의 프레임과 다른 CP길이의 프레임이 함께 사용될 경우, 상기 두 프레임의 간섭을 없애기 위하여 1/4 T b 의 CP 길이의 프레임에서 상기 다른 CP 길이의 프레임과 중첩되는 심볼을 천공한 프레임을 도시한 도면이다. Figure 8 when used in conjunction with the frame of the frame and different CP length of CP length of 1/4 T b in 8.75MHz band and the other two in the CP length of 1/4 T of the b-frame in order to eliminate the interference of the CP frame, a view showing one frame are punctured symbols and frame overlap length. 상기 도 7에서 설명한 바와 마찬가지로, 상기 도 8은 사용 가능한 하향링크 대 상향링크 비율 중 일 예로 다른 CP 길이의 프레임의 하향링크 대 상향링크의 하향링크 대 상향링크의 비율이 가 4:3인 경우에 대한 1/4 T b 의 CP길이의 프레임에서의 천공된 프레임을 나타낸다. Similarly described in connection with FIG. 7, FIG. 8 using the DL for UL rate ratio of the downlink for the uplink in the downlink for the uplink of the frame in one example of the other CP lengths are 4 possible: in the case where 3 to indicate a perforated frame in a CP length of 1/4 T b frames. 다른 CP 길이의 프레임과의 프레임 정렬을 맞추기 위해서 천공되는 심볼은 하향링크 영역 또는 상향링크 영역에 위치할 수 있다. Symbols to be punctured in order to match the alignment of the frame and the other CP length of the frame may be located in the downlink region or the UL region. 1/4 T b 의 CP 길이의 프레임에서의 189.6μ의 TTG를 사용하는 경우 우선적으로 하향링크와 상향링크의 전환점을 맞추기 위해서 하향링크 영역의 심볼을 천공하는 것을 고려할 수 있다. 1/4 When using the TTG of 189.6μ in the CP length of the frame T b can be considered to preferentially punctures symbols of the DL region to match the turning point of the downlink and uplink. 이때 다른 CP 길이(예를 들어, 1/8T b 의 CP 길이나 1/16T b 의 The CP of different lengths (e.g., 1 / 8T b of the CP length and the 1 / 16T b CP 길이)와의 프레임 정렬을 맞추기 위해서 1/4 T b 의 CP 길이의 프레임에서 천공되는 심볼의 개수는 2개이며, 1/4 T b 의 CP 길이의 프레임의 상향링크 영역에서 천공되는 심볼의 개수는 1/8T b 의 CP 길이의 프레임과 공존하는 경우 3개이며, 1/16T b 의 CP 길이의 프레임과 공존하는 경우 2개이다. CP length) is the number of symbols to be punctured in a frame of a CP length of 1/4 T b is 2 to match with the frame alignment, the number of symbols punctured in the uplink region of the frame of a CP length of 1/4 T b is 1 / 8T b of a three coexists with the frame of the CP length, 1 / 16T b of the second dog when coexisting with the frame of the CP length. 또 다른 경우로 1/4 T b 의 CP 길이의 프레임에서의 61.6μ의 TTG를 사용하는 경우에 1/8T b 의 CP 길이의 프레임이나 1/16T b 의 CP길이의 프레임과 하향링크에서 하향링크와 상향링크의 전환점을 맞추기 위하여 천공되는 심볼의 개수는 3개로 동일하며 1/4 T b 의 CP 길이의 프레임의 하향링크 대 상향링크의 비율이 3:3인 경우 상향링크 영역에서 중첩을 피하기 위해 천공되는 심볼의 개수는 189.6μ의 TTG를 사용하는 경우와 동일하게 1/8T b 의 CP 길이의 프레임에 대해서는 3개이며 1/16T b 의 CP 길이의 프레임에 대해서는 2개이다. When using addition of 61.6μ TTG in a CP length of 1/4 T b the frame to the other, when the 1 / 8T b of the downlink in the downlink frame and the CP length of the CP length of a frame or a 1 / 16T b the number of symbols to be punctured in order to match the turning point of the uplink is equal to three and the down-link ratio of the uplink of the CP length of 1/4 T b frame 3: in case of 3 in order to avoid overlap in the UL region the number of symbols to be punctured is equal to the case of using the TTG of 189.6μ 1 / 8T b for the frame of a CP length is 3 1 / 16T b of the dog 2 for the frame of the CP length. 또한 서로 다른 CP 길이를 가지는 프레임 간에 서로 중첩되는 서브프레임이 존재하는 경우, 중첩되는 서브프레임을 천공하여 서로 다른 CP 길이를 가지는 프레임간의 중첩을 피할 수 있다. In addition, if the sub-frames overlap each other is present between the frame having different CP lengths, by puncturing the overlapping sub-frame it can be avoided overlap between frames having different CP lengths. 1/4 T b 의 CP 길이의 프레임에서 다른 CP 길이를 가지는 프레임과 간섭 없이 공존하기 위하여 수행하는 천공에 관한 정보는 프레임의 SFH, A-MAP과 제어정보를 이용하여 전송되며, 이때 천공에 관한 정보는 제어 신호 내에서 2비트 내지 3비트를 이용하여 전송된다. 1/4 on the frame of the CP length T b on the information perforations to do in order to co-exist without interfering with the frame having a different CP length is transmitted using a frame of the SFH, A-MAP as control information, wherein on the perforated information is transmitted using 2 bits to 3 bits in the control signal. 앞에서 예를 든 하향링크 대 상향링크 비율 이외에 사용 가능한 다른 하향링크 대 상향링크 비율에도 이와 같은 천공 정보와 방법을 이용하여 프레임 정렬을 맞출 수 있으며 공존하는 프레임간의 간섭을 줄일 수 있다. For front can adjust the frame in alignment with the drilling information such as how different downlink versus uplink rate available in addition to all the downlink versus the uplink rate and may reduce interference between the co-existing frame. 또한 1/4 T b 의 CP길이의 프레임과 하향링크 또는 상향링크 영역에서의 중첩을 방지하기 위해서 다른 CP 길이를 가지는 프레임에서 위에서 언급한 것과 같이 하향링크 또는 상향링크 영역에서 중첩되는 심볼을 천공하여 프레임의 정렬을 일치시킬 수 있다. In addition, by puncturing the symbols overlap in the DL or the UL region as mentioned above, in a frame having a different CP length in order to avoid overlap in T b 1/4 CP length of the frame and the DL or the UL region of the It can match the alignment of the frame. 이때 천공되는 심볼의 개수는 각 CP 길이에 따른 심볼의 길이에 따라서 1/4 T b 의 CP길이의 프레임의 경우와 같거나 다를 수 있다. The number of punctured symbols may be the same as in the case of the frame of the CP length of 1/4 T b depending on the length of the symbol for each CP length or different. 또한 이러한 천공되는 심볼의 개수는 상기에서 언급한 것과 동일하게 2 내지 3비트의 정보를 이용하여 전송되며 이때 천공되는 심볼의 위치에 대한 정보도 같이 전송되거나 혹은 따로 독자적으로 전송될 수 있다. In addition, the number of these perforated symbols were transmitted using the information in the same manner as 2 to 3 bits as mentioned above may be transmitted on its own it is also transmitted or separately or as information about the position of the symbol that case drilling. 도 9는 7MHz 대역에서 1/4 T b 의 CP길이의 프레임이 구조가 다른 CP 길이를 가지는 프레임과 함께 사용될 경우, 상기 두 프레임의 간섭을 없애기 위하여 1/4 T b 의 CP길이의 프레임에서 상기 다른 CP 길이의 프레임과 중첩되는 심볼을 천공한 프레임을 도시한 도면이다. 9 is in the one-quarter of the length T b CP frame, the two in order to eliminate the interference of a frame when used in conjunction with a frame having a CP length of the frame structure is different CP length of 1/4 T b in the 7MHz band a diagram illustrating a frame perforation the symbol to be superimposed and frames of the different CP lengths. 특히, 상기 도 9는 1/8T b 의 CP 길이나 1/16T b 의 CP 길이의 프레임에서 하향링크 대 상향링크의 비율이 3:3이고, 1/4 T b 의 CP 길이의 프레임에서 하향링크 대 상향링크의 비율이 3:2 또는 2:3인 경우를 도시하고 있다. In particular, FIG. 9 is 1 / 8T b of the CP length and the 1 / b of 16T in the frame of a CP length for the three downlink ratio of the UL: DL in the frame of a 3, a CP length of 1/4 T b 3 shows a case of: a ratio of the uplink 3: 2 or 2. 우선 1/4 T b 의 CP 길이의 프레임에서 하향링크 대 상향링크의 비율이 3:2인 경우에, 1/4 T b 의 CP 길이의 프레임의 하향링크 영역이 다른 CP 길이(예를 들어, 1/8T b 의 CP 길이 또는 1/16T b 의 CP 길이)의 프레임의 상향링크 영역과 중첩된다. First 1/4 of the CP length in a frame of T b is the ratio of the DL for UL 3: 2 in the case of, the DL region of the frame of a CP length of 1/4 T b different CP length (e.g., It overlaps with an uplink region of the frame of 1 / 8T b of the CP length or 1 / 16T b CP length). 따라서 프레임 정렬을 맞추고 중첩을 피하기 위하여 1/4 T b 의 CP 길이의 프레임의 하향링크 영역에서 천공되는 심볼의 개수는 CP 길이에 상관없이 3 개이며 상향링크 영역에서 중첩을 피하기 위하여 1/4 T b 의 프레임의 CP 길이의 프레임의 하향링크 영역에서 천공되는 심볼의 개수는 프레임의 CP 길이에 상관없이 2개이다. Therefore, the number of punctured symbols in the DL region of the frame of a CP length of 1/4 T b, to avoid overlap, align the frame alignment is three regardless of the CP length of 1/4 to avoid overlap in the UL region T the number of punctured symbols in the DL region of the frame of the CP length of the frame of the dog b is 2 regardless of the CP length of the frame. 또한 서로 다른 CP 길이를 가지는 프레임 간에 서로 중첩되는 서브프레임이 존재하는 경우, 중첩되는 서브프레임을 천공하여 서로 다른 CP 길이를 가지는 프레임간의 중첩을 피할 수 있다. In addition, if the sub-frames overlap each other is present between the frame having different CP lengths, by puncturing the overlapping sub-frame it can be avoided overlap between frames having different CP lengths. 하향링크 영역 또는 상향링크 영역에서 심볼을 천공하는 경우에 천공하는 심볼의 개수 및 서브프레임에 대한 정보는 프레임의 SFH, A-MAP, 제어 정보 등을 이용하여 전송되며 천공에 관련된 정보는 제어 신호 내에서 2 내지 3비트를 이용하여 전송된다. My information for the symbol number and a sub-frame of the perforation in the case of puncturing the symbols from the downlink area or UL region is transmitted using a SFH, A-MAP, control information such as frame information related to a puncturing control signal in is transmitted using two or three bits. 또한 천공되는 심볼의 위치에 대한 정보는 심볼의 개수와 함께 또는 독립적으로 전송될 수 있다. Further information on the location of the symbols to be punctured can be transmitted or independently with a number of symbols. 상기 도 9는 사용 가능한 하향링크 대 상향링크의 비율이 3:3인 경우에 대한 예를 들고 있지만, 다른 하향링크 대 상향링크 비율(예를 들어, 2:6, 3:5, 4:4, 6:2 등)의 경우에도 마찬가지로 상기에서 언급한 천공을 적용하여 다른 CP 길이를 가진 프레임 간의 간섭을 제거할 수 있다. FIG 9 is enabled downlink ratio of the uplink 3: Although 3 carrying an example of a case where, other downlink versus uplink ratio (e. G., 2: 6, 3: 5, 4: 4, 6: it is possible to apply the perforations mentioned above to remove the interference between frames with different CP length Similarly, if the second, and so on). 또한 다른 CP 프레임과의 중첩을 방지하며 프레임 정렬을 맞추기 위해서 1/4 T b 의 CP 길이의 프레임에서 수행한 하향링크 또는 상향링크 심볼의 천공은 1/4 T b 의 CP 길이의 프레임과 맞추기 위하여 다른 CP 프레임에(예를 들어, 1/8T b 의 CP 길이의 프레임 또는 1/16T b 의 CP 길이의 프레임)에서도 수행될 수 있으며 이때 천공되는 심볼의 개수는 CP 길이에 따라 심볼의 길이가 서로 다르므로 위에서 설명한 심볼의 수와 같거나 다를 수 있다. In addition, the perforations in the downlink or uplink symbol carried out at the CP length of 1/4 T b the frame to fit the frame alignment, and avoid overlap with other CP frame to fit the frame of the CP length of 1/4 T b on the other CP frames can be performed in the (e.g., 1 / 8T b of the CP length frame or a 1 / 16T b-frame of the CP length of a), and each other wherein lengths of the symbols with the number of symbols to be punctured is the CP length varies may be the same as or different from the number of symbols as described above. 또한 심볼을 천공하기 위한 천공에 관한 정보는 천공되는 심볼의 개수, 천공되는 심볼이 포함된 서브프레임의 인덱스, 천공되는 심볼의 위치 등의 정보 중 하나 이상을 포함하는 조합으로 구성될 수 있으며, 이러한 천공에 관한 정보는 프레임의 SFH, A-MAP, 제어 정보 등을 이용하여 전송할 수 있다. Also be a combination of information on the puncturing for puncturing the symbol comprises at least one of information of the number, position, etc. of the index, which is punctured symbol of containing the symbols to be punctured sub-frame of symbols to be punctured, and this information about the puncturing may transmit using a frame including the SFH, a-MAP, control information. 또한 앞서 설명한 것처럼 1/4 T b CP길이의 프레임과 다른 CP 길이를 가지는 프레임간의 상향링크 영역과 하향링크 영역이 서로 중첩되지 않게 하기 위하여 다른 CP길이를 가지는 구조에서 중첩되는 영역에서 해당하는 심볼을 천공하여 프레임 정렬을 맞출 수 있다. In addition, a symbol that corresponds to the area to be superimposed on the other structure having a CP length in order to prevent the uplink region and the downlink region between the frames having a frame and a different CP length of 1/4 T CP length b overlap with each other as described earlier drilling can be adjusted by the frame alignment. 도 10은 사용자 기기 또는 기지국에 적용 가능하고 본 발명을 수행할 수 있는 디바이스의 구성을 나타내는 블록도이다. 10 is a block diagram showing the configuration of a device that can perform the present invention and applicable to a user equipment or a base station. 도 10에 도시된 바와 같이, 디바이스(100)는 처리 유닛(101), 메모리 유닛(102), RF(Radio Frequency) 유닛(103), 디스플레이 유닛(104)과 사용자 인터페이스 유닛(105)을 포함한다. To As, the device 100 shown in Figure 10 comprises a processing unit 101, a memory unit (102), RF (Radio Frequency) unit 103, a display unit 104 and user interface unit 105 . 물리 인터페이스 프로토콜의 계층은 상기 처리 유닛(101)에서 수행된다. Layer of a physical interface protocol is performed in the processing unit 101. 상기 처리 유닛(101)은 제 어 플레인(plane)과 사용자 플레인(plane)을 제공한다. The processing unit 101 provides a control plane (plane) and user plane (plane). 각 계층의 기능은 처리 유닛(101)에서 수행될 수 있다. The function of each layer can be carried out in a processing unit (101). 메모리 유닛(102)은 처리 유닛(101)과 전기적으로 연결되어 있고, 오퍼레이팅 시스템(operating system), 응용 프로그램(application) 및 일반 파일을 저장하고 있다. The memory unit 102 is electrically connected to the processing unit 101, and stores an operating system (operating system), applications (application), and general files. 만약 상기 디바이스(100)가 사용자 기기라면, 디스플레이 유닛(104)은 다양한 정보를 표시할 수 있으며, 공지의 LCD(Liquid Crystal Display), OLED(Organic Light Emitting Diode)등을 이용하여 구현될 수 있다. If the device 100 is the user equipment, the display unit 104 may be implemented by using a can display a variety of information, (Liquid Crystal Display), a known LCD, OLED (Organic Light Emitting Diode). 사용자 인터페이스 유닛(105)은 키패드, 터치 스크린 등과 같은 공지의 사용자 인터페이스와 결합하여 구성될 수 있다. The user interface unit 105 may be configured in combination with a known user interface such as a keypad, a touch screen. RF 유닛(103)은 처리 유닛(101)과 전기적으로 연결되어 있고, 처리 유닛(101)에 의해 제어되며 무선 신호를 송신하거나 수신한다. RF unit 103 is electrically connected to the processing unit 101, it is controlled by the processing unit 101 transmits or receives a radio signal. 이상에서 설명된 실시예들은 본 발명의 구성요소들과 특징들이 소정 형태로 결합된 것들이다. The embodiments described above are those of structural elements and features of the present invention are combined in a predetermined type. 각 구성요소 또는 특징은 별도의 명시적 언급이 없는 한 선택적인 것으로 고려되어야 한다. Each of the structural elements or features should be considered selectively unless specified separately. 각 구성요소 또는 특징은 다른 구성요소나 특징과 결합되지 않은 형태로 실시될 수 있다. Each element or feature may be practiced without being combined with other elements or features. 또한, 일부 구성요소들 및/또는 특징들을 결합하여 본 발명의 실시예를 구성하는 것도 가능하다. It is also possible to constitute the embodiments of the present invention by combining parts of the elements and / or features. 본 발명의 실시예들에서 설명되는 동작들의 순서는 변경될 수 있다. Operation orders described in embodiments of the present invention may be rearranged. 어느 실시예의 일부 구성이나 특징은 다른 실시예에 포함될 수 있고, 또는 다른 실시예의 대응하는 구성 또는 특징과 교체될 수 있다. Some constructions of any one embodiment may be replaced with corresponding structural elements or features of may be included in another embodiment or other embodiments. 특허청구범위에서 명시적인 인용 관계가 있지 않은 청구항들을 결합하여 실시예를 구성하거나 출원 후의 보정에 의해 새로운 청구항으로 포함시킬 수 있음은 자명하다. That constitute the embodiments by combining the claims it does not have an explicit cited relation in the appended claims or may include new claims by means of amendment after the application is self-evident. 본 발명에 따른 실시예는 다양한 수단, 예를 들어, 하드웨어, 펌웨어(firmware), 소프트웨어 또는 그것들의 결합 등에 의해 구현될 수 있다. Embodiment according to the present invention can be implemented by various means, for example, hardware, firmware (firmware), software, or a combination thereof. 하드웨어에 의한 구현의 경우, 본 발명의 일 실시예는 하나 또는 그 이상의 ASICs(application specific integrated circuits), DSPs(digital signal processors), DSPDs(digital signal processing devices), PLDs(programmable logic devices), FPGAs(field programmable gate arrays), 프로세서, 콘트롤러, 마이크로 콘트롤러, 마이크로 프로세서 등에 의해 구현될 수 있다. In case of the implementation by hardware, an embodiment of the present invention, one or more ASICs (application specific integrated circuits), DSPs (digital signal processors), DSPDs (digital signal processing devices), (programmable logic devices) PLDs, FPGAs ( may be implemented by a field programmable gate arrays), processor, controller, microcontroller, microprocessor. 펌웨어나 소프트웨어에 의한 구현의 경우, 본 발명의 일 실시예는 이상에서 설명된 기능 또는 동작들을 수행하는 모듈, 절차, 함수 등의 형태로 구현될 수 있다. In case of the implementation by firmware or software, one embodiment of the present invention can be implemented in the form of a module, a procedure, a function, which performs functions or operations described above. 소프트웨어 코드는 메모리 유닛에 저장되어 프로세서에 의해 구동될 수 있다. The software codes may be stored in a memory unit and driven by a processor. 상기 메모리 유닛은 상기 프로세서 내부 또는 외부에 위치하여, 이미 공지된 다양한 수단에 의해 상기 프로세서와 데이터를 주고 받을 수 있다. The memory unit is located inside or outside the processor may be by various known means to exchange data with the processor. 본 발명은 본 발명의 정신 및 필수적 특징을 벗어나지 않는 범위에서 다른 특정한 형태로 구체화될 수 있음은 당업자에게 자명하다. The invention can be embodied without departing from the spirit and essential characteristics of the present invention in other specific forms will be apparent to those skilled in the art. 따라서, 상기의 상세한 설명은 모든 면에서 제한적으로 해석되어서는 아니 되고 예시적인 것으로 고려되어야 한다. Accordingly, the detailed description of the above is not restrictive construed in all aspects and should be considered as illustrative. 본 발명의 범위는 첨부된 청구항의 합리적 해석에 의해 결정되어야 하고, 본 발명의 등가적 범위 내에서의 모든 변경은 본 발명의 범위에 포함된다. The scope of the invention should be determined by reasonable interpretation of the appended claims and all modifications within the equivalent scope of the invention are included within the scope of the invention. 본 발명은 무선 이동 통신 시스템의 단말기, 기지국, 또는 기타 다른 장비에 사용될 수 있다. The present invention can be used in the terminal, base station, or any other equipment of a radio mobile communication system. 도 7은 5, 10, 20 MHz 대역에서 1/4 T b 의 CP 길이의 프레임과 다른 CP길이의 프레임이 함께 사용될 경우, 상기 두 프레임의 간섭을 없애기 위하여 1/4 T b 의 CP 길이의 프레임에서 상기 다른 CP 길이의 프레임과 중첩되는 심볼을 천공한 프레임을 도시한 도면이다. 7 is a frame of the 5, 10, 20 MHz when used in the range of 1/4 T b with the frame of the frame and the other CP length of CP lengths, a CP length of 1/4 T b of the two in order to eliminate the interference of the frame in a diagram illustrating a puncturing the symbols of the frame and the overlapping different CP length frame. 도 8은 8.75MHz 대역에서 1/4 T b 의 CP 길이의 프레임과 다른 CP길이의 프레임이 함께 사용될 경우, 상기 두 프레임의 간섭을 없애기 위하여 1/4 T b 의 CP 길이의 프레임에서 상기 다른 CP 길이의 프레임과 중첩되는 심볼을 천공한 프레임을 도 시한 도면이다. Figure 8 when used in conjunction with the frame of the frame and different CP length of CP length of 1/4 T b in 8.75MHz band and the other two in the CP length of 1/4 T of the b-frame in order to eliminate the interference of the CP frame, a frame with a perforation overlap the symbols of the frame length is a time limit diagram. 도 9는 7MHz 대역에서 1/4 T b 의 CP길이의 프레임이 구조가 다른 CP 길이를 가지는 프레임과 함께 사용될 경우, 상기 두 프레임의 간섭을 없애기 위하여 1/4 T b 의 CP길이의 프레임에서 상기 다른 CP 길이의 프레임과 중첩되는 심볼을 천공한 프레임을 도시한 도면이다. 9 is in the one-quarter of the length T b CP frame, the two in order to eliminate the interference of a frame when used in conjunction with a frame having a CP length of the frame structure is different CP length of 1/4 T b in the 7MHz band a diagram illustrating a frame perforation the symbol to be superimposed and frames of the different CP lengths. 도 10은 사용자 기기 또는 기지국에 적용 가능하고 본 발명을 수행할 수 있는 디바이스의 구성을 나타내는 블록도이다. 10 is a block diagram showing the configuration of a device that can perform the present invention and applicable to a user equipment or a base station. 신호 전송 방법. A signal transmission method.